The Garuda emerges from its egg fully formed and ready to fly. Within Dzogchen, this is symbolic of our primordial natural state. It exists within us, already fully formed, for us to reveal. 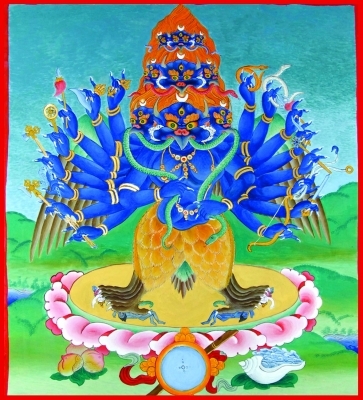 Garuda also exists as an enlightened deity who can help us. We need help as we still exist within a world of duality and there is the potential for harm to us from other beings. All Dzogchen Community deity practices are Anuyoga and offer a path to enlightenment. They can also be incorporated into Atiyoga practice used to reveal our true nature, the path leading to Dzogchen. We should always remember that the principal purpose for practices of an enlightened deity such as Garuda is total realisation. We should also remember that Garuda practices and mantras, like those of other enlightened beings, can be used for all purposes as long as we have confidence in using them. There are Garuda practices for the removal of obstructions to our practice, especially illnesses and other harm from different classes of spirits, which can affect our physical and mental well-being. It is important to understand how provocations may arise and how to avoid our own negative actions. These practices include powerful, sometimes wrathful, mantras and invocations to link us with the Garuda and his power. There are Eight Classes of beings which may harm us through negative forces and provocations. All Garuda forms are Enlightened Beings and can help us in a general way, and are depicted with Naga serpents held in their beaks. However, some are especially effective for particular classes. This Garuda is especially connected with harm from the Naga class. The Red Garuda practice is especially useful in dealing with harm from the Tsen class, which may include cancer. Dark Blue Garuda practice is particularly helpful with provocations from the Yaksha class. 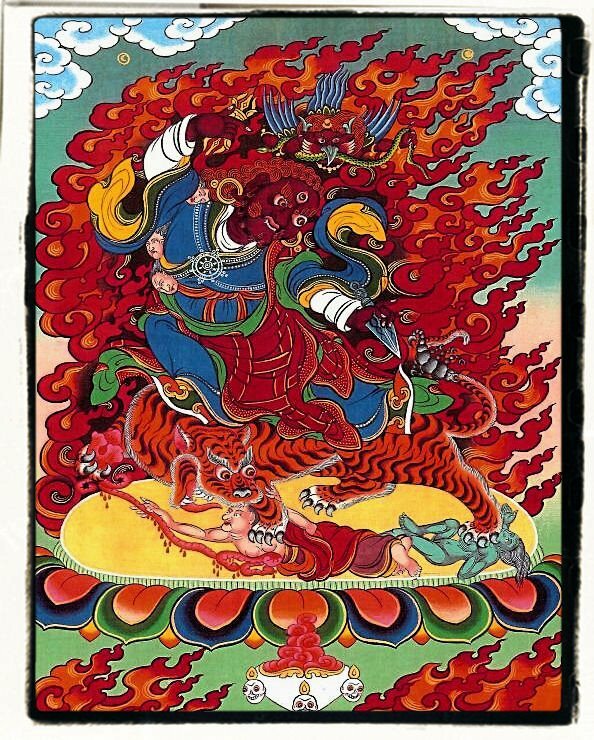 Guru Tragpo (Dragpo) is a wrathful form of Padmasambhava, combining Garuda with Hayagriva and Vajrapani. 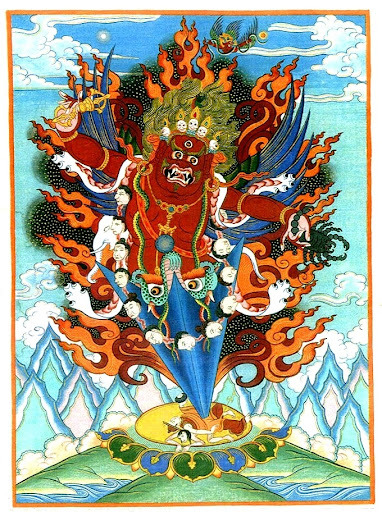 Vajrapani is for controlling celestial negative forces, Hayagriva is for controlling terrestrial negative forces, and Garuda is for controlling subterranean negative forces. 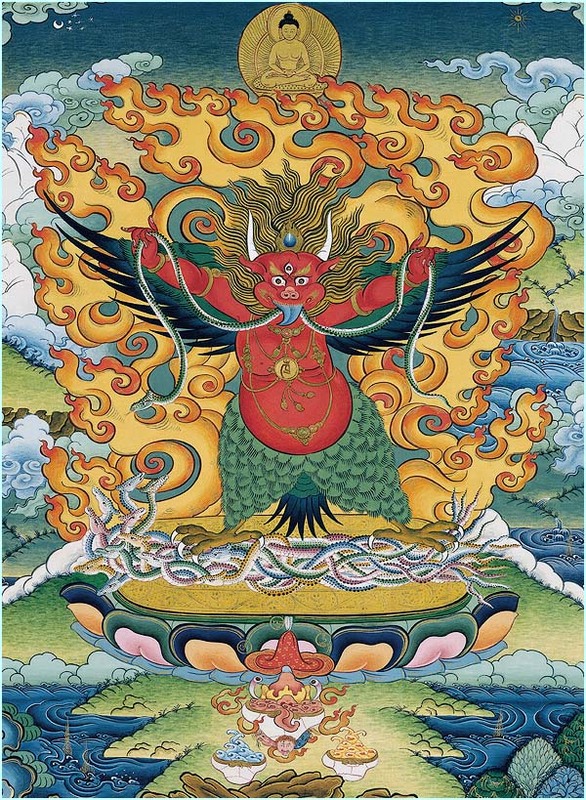 Guru Tragphur (Dragphur) is a very powerful and wrathful form combining Garuda with Hayagriva, Vajrapani, Vajrakilaya and Yangdag Heruka. It is especially useful for extreme negative harm from the Gyalpo class. 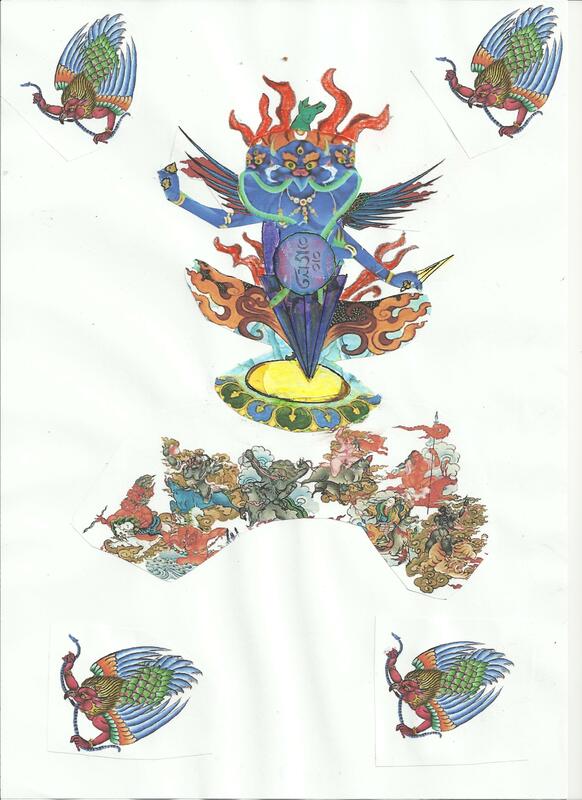 There are many events relating to deities which you may attend, including Garuda ‘lung’ empowerments and Retreats for the development of good and stable practice. Familiarity with the main practice and mantra is especially important before using ‘action mantras’. Many of the events are broadcast via internet webcast, giving access to those people unable to travel to attend in person. Some of the webcasts are ‘open’ and anyone can have access. Others are ‘closed’ and only for Members of the Dzogchen Community. Often, ‘lung’ empowerments are given during open webcasts. However, the primary empowerment within the Dzogchen Community is that of sharing the natural state with the Guru, called Direct Introduction. This should always be a first step, in accordance with the First Statement of Garab Dorje. More information on this is easily obtained from the Dozgchen Community. It is helpful to read an introductory text, such as’ The Crystal and the Way of Light’ by Chögyal Namkhai Norbu Rinpoche, which introduces all the main Dzogchen concepts and also offers an entertaining and informative autobiography. Copies are available from Amazon. Membership also offers many other benefits, including access to restricted books and other media, and some discounts. All content remains the copyright of the original holder, and I am most grateful to Chögyal Namkhai Norbu Rinpoche and to the Shang Shung Institute for their kind permission to use and summarise content from Dozgchen Community teachings.